New digital presence for national engineering consultants. 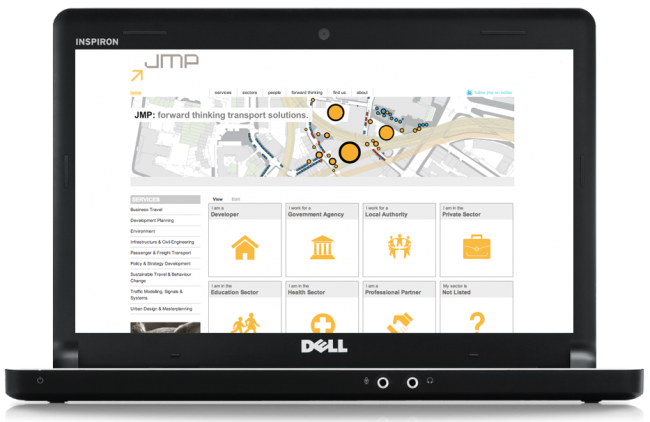 JMP is one of the UK’s leading independent transport consultancies, with nine offices spread across the UK. The company is dedicated to developing sustainable solutions to the country’s transport issues, and strive to demonstrate how sustainability can promote commercial as well as environmental benefits. Having undergone a corporate rebranding several years ago, the company’s website had been struggling to make an impact on potential clients, and lacked the flexibility required to enable regular content updates. We were asked to develop a bespoke website as replacement. The new system had to allow for regular news updates, as well as functions such as profiles for key staff members, job listings and project experience case studies. SEO techniques had to be embedded within the site to ensure its visibility when it came to organic search queries. This natural marketing was to be supported by other digital efforts through Google Adwords, Twitter and LinkedIn. The complexity of the website required significant thought relating to information architecture. Once the content strategy was in place, we were in a position to produce a number of wireframes for consideration by the website’s steering group. The design places the company’s core services at the forefront; visible on each page of the website. The ‘Forward Thinking’ section of the website provides space for the company’s staff to post relevant articles, which are then linked to their individual website profiles; providing a point of reference for potential clients. Tweets are automatically generated as new content is posted, keeping the company’s digital followers up-to-date with the latest developments. The company’s Twitter account was personalised to reflect the new website; providing a consistent theme for visitors moving between the sites. The web analytics monitoring of the site is closely linked to the company’s corporate Google Adwords account, ensuring maximum efficiency of the marketing exercise. The site was completed in early 2011. Since that time, the company has seen measurable growth in the number of enquiries generated through it, both to individual staff members listed as well as to general offices. The website provides a clear platform for prospective employees to gain information about the company, as well as applying for specific roles advertised. This enhanced functionality has reduced the requirement for the company to use recruitment consultants, further reducing external expenditure. BrightPie continue to manage the website on behalf of JMP, ensuring timely updates to content, as well as structural or thematic changes as requested.